Bring a pot of salted water to a boil. Cook the spaghetti al dente according to package directions. While pasta is cooking, start cooking the bacon in a small frying pan for 5-7 minutes or until done. Drain bacon on paper towels and pour off drippings. In the pan that you cooked the bacon add the onions, oil, and garlic and cook for a couple minutes over medium heat or until onions are soft. Remove from the heat and add the bacon. Season the beaten eggs well with salt and pepper. As soon as the pasta is done, drain and return pasta to the pan. Immediately add the egg mixture to the pasta. The eggs are actually cooked by the hot pasta. Stir the egg mixture until it is well mixed. Pour in the mixture from the frying pan on top of the noodles and stir. Stir in the Parmesan cheese and serve. When he’s not making movies or jumping on Oprah’s couch, Tom Cruise finds himself in the kitchen cooking up some wicked Spaghetti Carbonara. The self proclaimed “King of Carbonara” set high expectations for his signature dish and I was intrigued to see if his recipe lived up to it. Is the fact that I was licking my plate a good sign that I liked it? I customized Tom’s recipe to make this version of Spaghetti Carbonara to my family’s liking and changed some of the proportions that seemed a bit off. 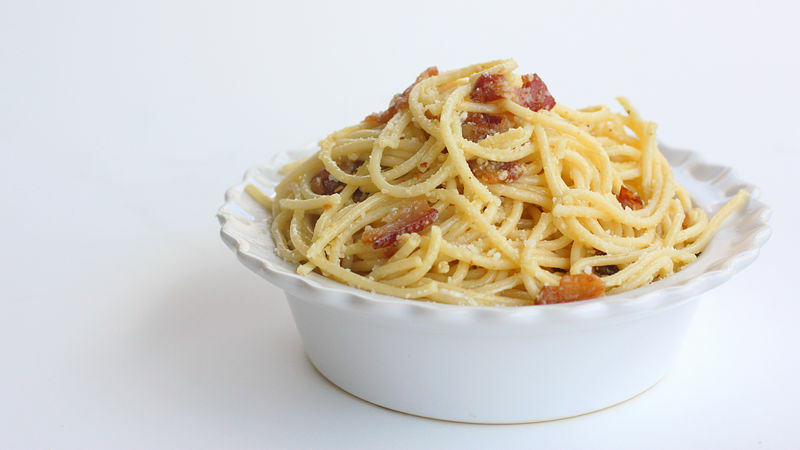 Spaghetti Carbonara is a classic bacon and egg Italian pasta. It’s an unbelievably simple dish that comes together in around twenty minutes. The flavor was amazing! The slight taste of egg, garlic, and onion mixed with the savory bacon and Parmesan-coated spaghetti had me at first bite. The most important part of this recipe is to add the beaten eggs to the pasta immediately after it’s cooked and drained. The heat from the pasta cooks the eggs in the traditional Italian way. The best part is the leftover bits of bacon and egg at the bottom of the pasta bowl that have soaked up all of the flavors. Don’t tell anyone -- it can be a treat for you when you are cleaning up the dishes! If you're a spaghetti fan, here are more versions of the classic dish to share with others who favor the flavor!